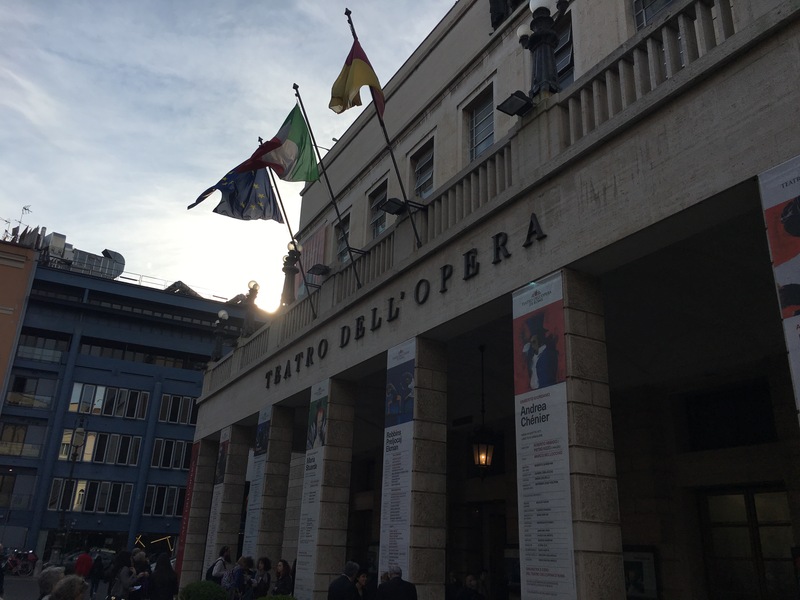 Springtime in Rome is one of the best reasons to combine a visit to the eternal city with a great opera – and exactly this was my plan booking a long weekend in Rome in cold January evening. Both targets well achieved – the weather was sunny and above 20c and Marina Rebeka as Maria Stuarda was well worth the visit. The storyline of the opera is based on Friedrich Schiller’s play about Mary, Queen of Scots and her political and personal rivalry with Queen Elizabeth I of England. Emotional meeting of the queens is invented by Schiller, nevertheless, it is the climax of the drama and provides a great showcase of main protagonists. They both are in love with the same man, they belong to different churches and they both have the ambition to rule the empire, believing in their entitlement. The fight for love and power usually ends with death. Donizetti has created wonderful music with rich orchestration, choruses and signature arias for all three main characters. The premiere of the new production was on March 22nd, thus the last performance for Rebeka in this run was promising well-aligned ensemble and smooth production, which was an expectation put a bit too high. Her role debut in Riga in concert version in January with Katja Levin and Bulent Bezduz, agile and energetic orchestra conducted by John Fiore was breathtaking, unfortunately, this performance came a bit short due to several issues in staging and conducting. The first impression of the production by Andrea De Rosa – dark empty stage with a red chair as centrepiece elevated on the rectangular platform. Minimalistic – with some illustrative decorum sets in later scenes, and impressive, even if a bit overexerted slaughterplace in the finale. In overall the sets were self-explanatory and effective, the costumes provided good alignment with historic period. 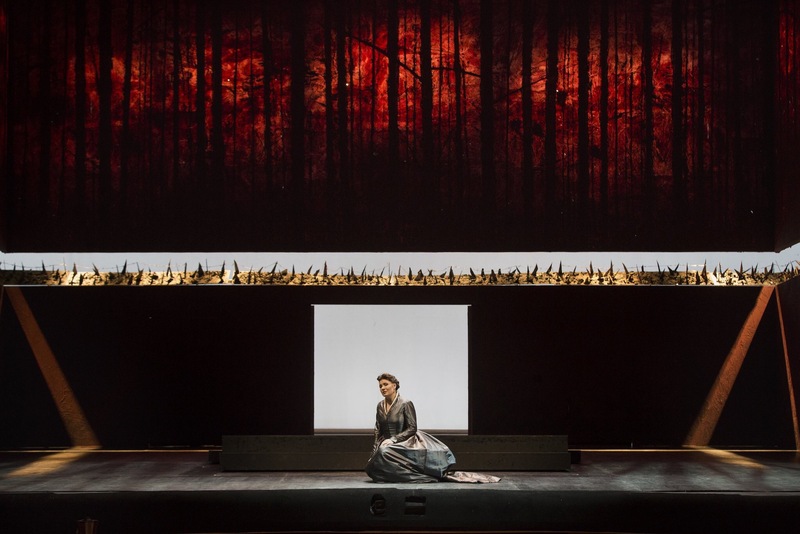 The only question lingering was the dress for Maria Stuarda for the finale – especially those blood red gloves with a plastic lining to enable her to extinguish candles. There was fun disruption by electricity during Act 1 twice, which distracted the audience. The lights for the auditorium came up in full blaze while those on the stage and orchestra went black, the surtitle projector struggled to resume operations. After a few minutes the normal order was restored. Then the same sequence of lightning show repeated ten minutes later, now audience laughing and swearing. I have to note impeccably professional performance by Rebeka as her first appearance coincided with the first electricity mishap. She continued to carry on as per libretto without hesitation, doing it in the unexpected darkness encompassing the stage. Another shortcoming of the production is an underuse of dramatic capabilities of great singing actors and producing a relatively static performance. Most of the scenes were directed according to the scheme entrance – deliver – depart, thus fragmenting the storyline and not helping main characters to engage in meaningful stage action. The orchestra led by Paolo Arrivabeni at first sounded geriatric, like the gestures of the conductor were too demanding. The beginning was played with significantly slower tempo than I have heard either live or recorded. That changed for better later, tempi became more energetic, but orchestra did not show much agility. Sometimes singers got covered, except Rebeka, and the chorus at the first scene run in brief disagreement with the orchestra. All those moments, emphasised by double electricity fail, made an impression of uneven and a bit haphazard production. 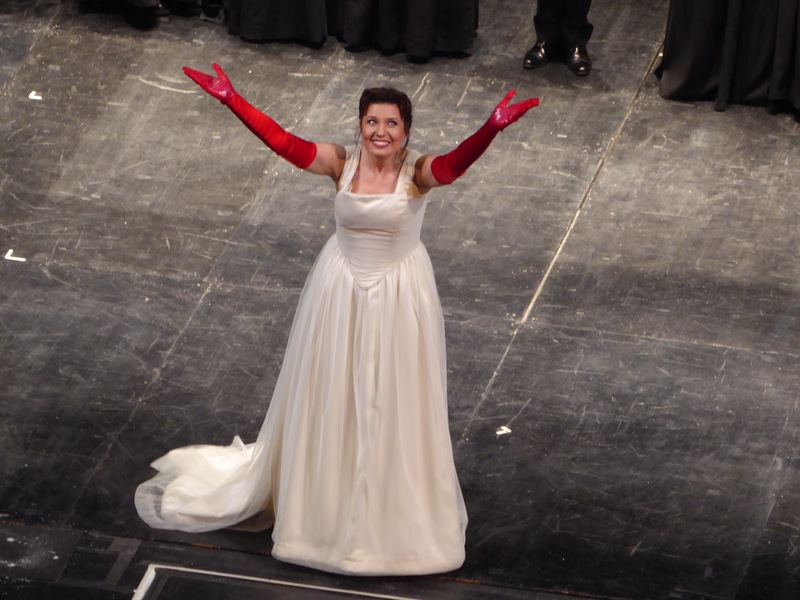 Only outstanding singing was saving the performance, and Marina Rebeka was the shining star of the night. 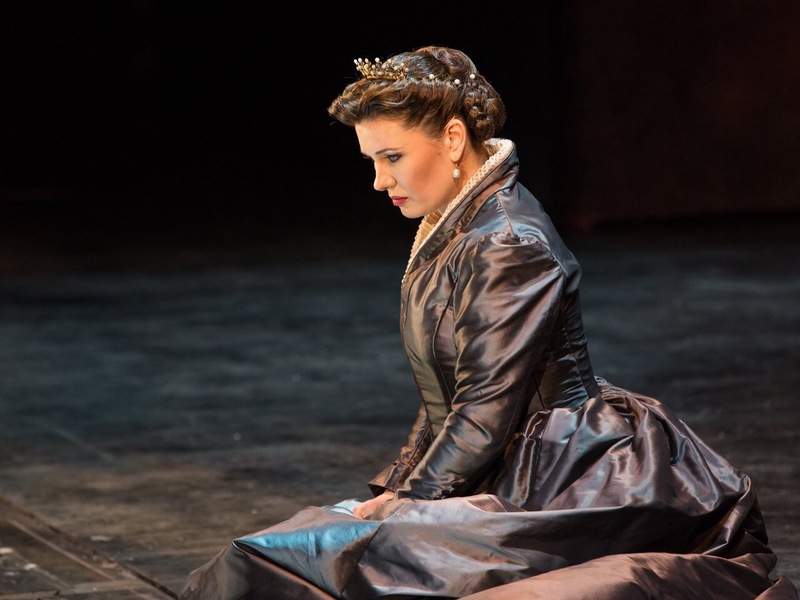 The main protagonists – Elisabetta (Carmela Remigio) and Maria Stuarda (Marina Rebeka) both carried the weight of the royal destiny with grace. Remigio had a weak moment in the beginning of Act 1 but soon recovered and demonstrated sound and wholesome portrayal of her heroine painting with vocal means masterfully. Her lower register is rich, the top clear and strong and she well blends into ensemble singing. The most memorable dramatic passages were filled with hatred and jealousy, even hissing rather than singing respective passages. Marina Rebeka has grown into the role compared with her debut in January, her emotions are better controlled, and the tone is warm but crystalline and crisp, her top notes clear and ringing without a hint of metal. The role suits Marina well, she carries both dramatic and vocal demands of it confidently. Looking forward to her next roles in pursuing more dramatic repertoire impatiently! Her concert version of Norma will be performed in Riga in April. Paolo Fanale as Robert had uneven night, in some scenes his vocal capability was shown excellently, in others he was lost behind the orchestra. The tone is typical Italianate, he has no difficulty to reach for the higher notes, and his signature aria Ah! 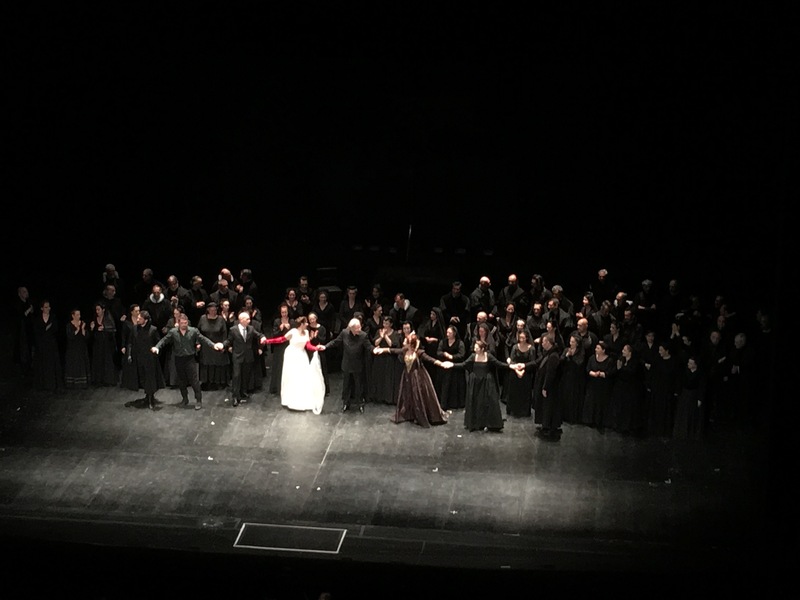 rimiro il bel sembiante earned long and enthusiastic applause from the audience. Carlo Cigni as Talbot did not leave a memorable impression either as a character or as a performer. It was the first time for me in the Teatro dell’Opera di Roma. Originally opened in November 1880 as the 2,212 seat Costanzi Theatre, it has undergone several changes and now seats 1,600. The house has three tiers of boxes, an amphitheatre and two separate galleries, its dome is adorned with frescoes by Annibale Brugnoli. After rebuilding in 1928 it got magnificent chandelier measuring six meters in diameter and composed of 27,000 crystal drops. Worth to know that it was inaugurated with a performance of Semiramide by Gioachino Rossini. Maria Stuarda by Gaetano Donizetti. Previous Post: Revolution personalised: Jonas Kaufmann as Andrea Chénier in Munich.